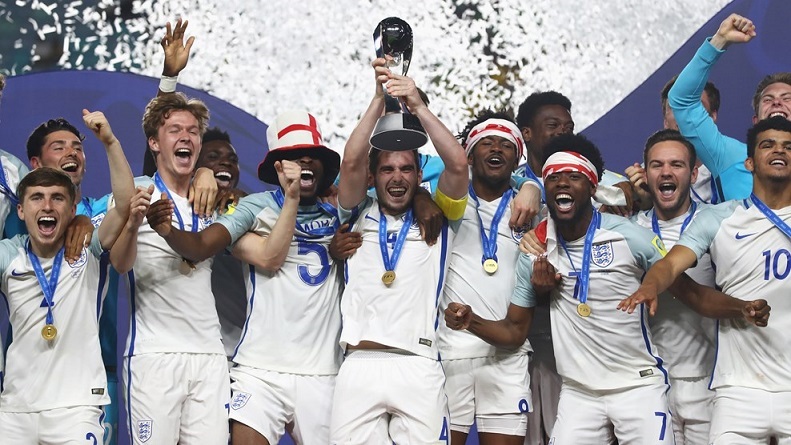 England wins FIFA Under 17 World Cup 2017 trophy. England defeat Spain by 5-2. Rhian Brewster turned out a second scintillating display in as many matches to fire England U17s past Brazil U17s to book a spot in the World Cup final. Brewster backed up his formidable display in the quarter-final with his second hat-trick in as many outings to ensure Steve Cook's side came away 3-1 winners against the Brazilians. The triple strike took Brewster to seven goals, the highest in the tournament. This is the first time that a player has scored two hat-tricks in the same edition of a tournament. Spain staved off a battling Mali to emerge 3-1 winners in a rip-roaring, action-packed semi-final contest to enter the summit clash of the FIFA U-17 World Cup at the D Y Patil Stadium, in Navi Mumbai. By virtue of this win, Spain has entered the final of the FIFA U-17 World Cup for the fourth time.